The second issue of Sloto Magazine, the official magazine of Sloto Cash Casino will be delivered to slots players all over the world next week. 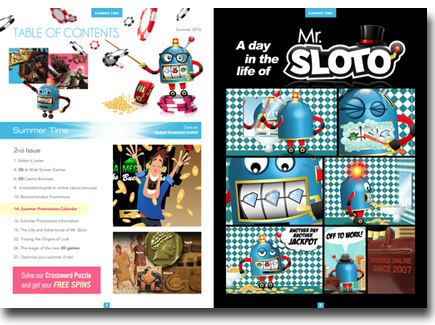 Like the first issue, it'll have nearly 30 pages of fun articles, stories, puzzles, contests and lifestyle tips as well as dozens of promotional coupons for free spins and casino bonuses at Sloto Cash Casino. Slots magazine features calendar of casino bonuses. Every Sloto Magazine has a seasonal 3 month calendar with a dozen or more Free Spins and Bonus coupons on special dates and holidays. With this calendar players can look forward to an exciting summer full of great chances to win. 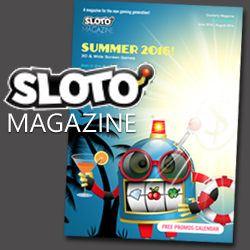 The Spring 2016 edition of Sloto Magazine has an article discussing the pros and cons of three casino platforms: download, instant play and mobile and a feature story on what we can look forward to in mobile casino games. If you're wondering how to spend your casino winnings, there’s a travel article about spring holiday destinations. Perhaps the most important section of the magazine is its Promotions Calendar with three months of free spins and deposit bonus offers at Sloto Cash Casino. The Summer issue will include priceless tips to help you become better casino players and a comprehensive guide to online casino bonuses over the summer.